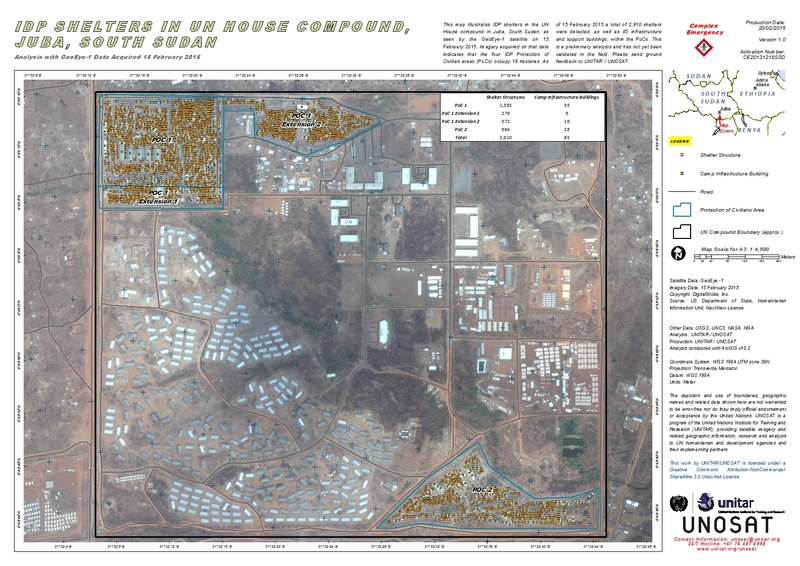 This map illustrates IDP shelters in the UN House compound in Juba, South Sudan, as seen by the GeoEye-1 satellite on 15 February 2015. Imagery acquired on that date indicates that the four IDP Protection of Civilian areas (PoCs) occupy 16 hectares. As of 15 February 2015 a total of 2,910 shelters were detected, as well as 85 infrastructure and support buildings, within the PoCs. This is a preliminary analysis and has not yet been validated in the field. Please send ground feedback to UNITAR / UNOSAT.